Heart, Aunt Bee: Letters: Day Seven or Seriously, Rock Chalk Jayhawk! 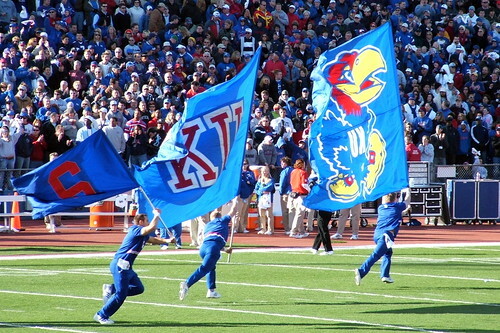 Letters: Day Seven or Seriously, Rock Chalk Jayhawk! I know this seems really out of the blue and maybe you're thinking about how we don't even know each other. But that doesn't matter. What matters is that I am so in love with you. Twenty years ago, I was just a wee nine years old. I sat on the floor and fell in love with Danny Manning as he led the Jayhawks to win the 1988 National Championships. I was too young, then, and it just would not have worked out between Danny and me. But I'm much more mature, now. I watched your shot and just knew it wasn't going to go in. It just didn't look like you had set it right. But I should have known. I had already sung your praises and predicted the win. When that ball came out the bottom of the net for three points to tie, I fell to my knees. I wasn't sure I could handle the stress. Twenty years after KU's last championship, and I'm on the floor again, begging you and your team to make some points. You guys sure like to toy with my emotions! I can't even believe what I just saw! It feels like New Years. I had to call everyone just to say "Rock Chalk!" On my way home, I listened to Sasha talk about the game. He was asked how he feels and he said "I love everyone!" That's totally how I feel right now. Except for Roy. I wonder how it felt to watch KU finally coached to the championship they deserved? Congratulations to you and your team, dear Mario!